There are many limitations to Chrome OS, but seen from another angle its lack of bells and whistles is what makes it so appealing. It’s also a place where Google goes to test out some of its more forward-thinking ideas, including today’s topic: The ability to unlock a Chromebook with your Android smartphone. Here’s how it’s done. 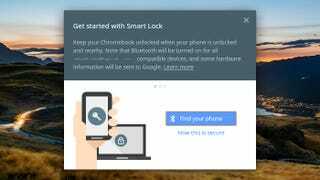 It’s called Smart Lock for Chrome and to use it you need a smartphone with Bluetooth and Android 5.0 or higher. The Chromebook needs to be running Chrome OS version 40 or higher and it must have Bluetooth capabilities too. For now, Android tablets aren’t supported. With those preliminaries out of the way, open up the Settings screen on your Chromebook (either from a browser tab or the notification area). Click Show advanced settings and then Smart Lock to get the feature up and running—you’ll be prompted to enter your password first to prove you are who you say you are. Click Find your phone to begin the Bluetooth pairing process; when your phone is discovered (it is nearby with Bluetooth on, right?) choose Use this phone to confirm. You can then click Try it out to see the feature in action or head to Smart Lock settings to see a help page. You can disable the feature by opening the Settings page and selecting Turn off Smart Lock. On the Chrome OS login screen, when your paired phone is nearby, you’ll see a green unlocked padlock symbol next to the password field—all that you need to do then is click once on your profile picture to gain entry. Note that your phone must be unlocked for this to work: If it isn’t, Chrome OS tells you to unlock it to proceed.